Farnham and Burlington: Ashgate 2015. xiii+310pp. One of the elements that many readers admire in Kierkegaard’s skill as a writer is in his ability to create different voices and perspectives in his works. Instead of unilaterally presenting clear-cut doctrines and theses, he confronts the reader with different personalities and figures who all espouse different views. One important aspect of this play of perspectives is Kierkegaard’s controversial use of pseudonyms. 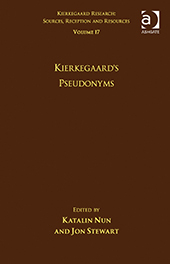 The present volume is dedicated to exploring the different pseudonyms and authorial voices in Kierkegaard’s writings. The working assumption is that there is something unique and special about each pseudonym. The articles featured here try to explore each pseudonymous author as a kind of literary figure and to explain what kind of a person is at issue in each of the pseudonymous works. The hope is that by taking seriously each of these figures as individuals, we will be able to gain new insights into the texts which they are ostensibly responsible for. Johannes de silentio: Religious Poet or Faithless Aesthete? Johannes the Seducer: The Aesthete par excellence or on the Way to Ethics?